Brevard County (Fla.) Commissioner Kristine Isnardi, left, holds a resolution in recognition of posthumous Carnegie Medal awardee Delbert G. Blare. 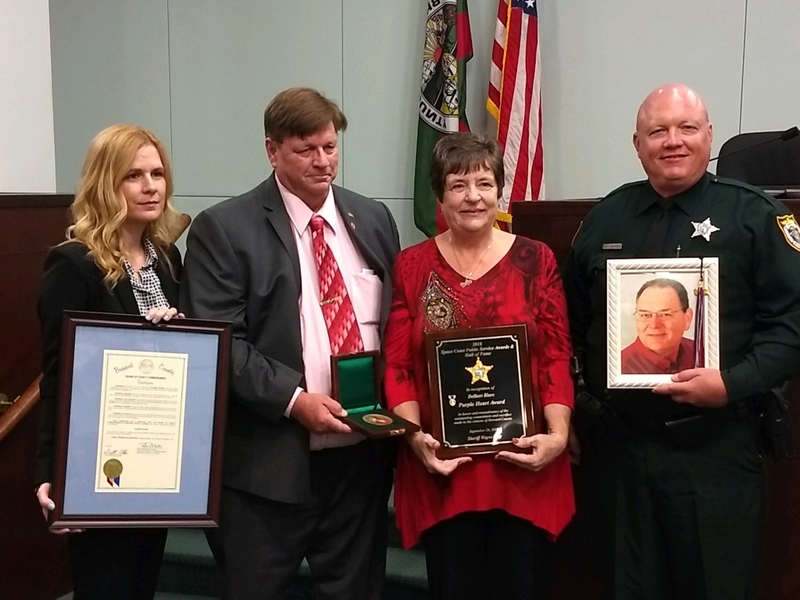 Next to her, from left, is Carnegie Hero Fund volunteer presenter Ralph Cash Kaschai holding the Carnegie Medal; Blare’s widow, Debra Blare, holding her husband’s Purple Heart from the Space Coast Public Safety Award and Hall of Fame and Brevard County Sheriff’s Department; and Brevard County Sheriff’s deputy Kent Guttebo, holding a photo of Blare with a tassel that represents the Posthumous Doctorate Degree of Divinity awarded to Blare by the Light of Faith Christian Ministries, where he graduated with a doctorate. Debra Blare was presented the Carnegie Medal Nov. 13 at a Brevard County Commissioners meeting at the government center in Viera, Fla.
One year earlier, Blare, 61, of Melbourne, Fla., entered water off of Melbourne Beach, Fla., and swam toward a man, 61, calling for help about 200 feet from the beach. During the rescue effort, Blare submerged. The man ultimately reached wadable water where he assisted to shore by others. Blare drowned. Kaschai is a 1978 recipient of the Carnegie Medal for helping to rescue two men from a burning car on Dec. 10, 1976, in Orlando, Fla.